Nagas King - Maharaja Sri Ga, ca 340 A.D. Brahma bull stg. r.; RX: "Ganendra" in circle in Brahmi. AE 1/4 unit(1/4 kakini), probably 5 Ratti (1.02 g). Humped bull standing left / Maharaja Sri Ganendra in a circle in Brahmi. 10mm, 0.83 grams. Mitchiner 4739-4753. The Naga Kings held a large territory in Malwa and other regions (extending their territory as far as Mathura in the middle of the third century AD by taking it from the weakening Kushans). 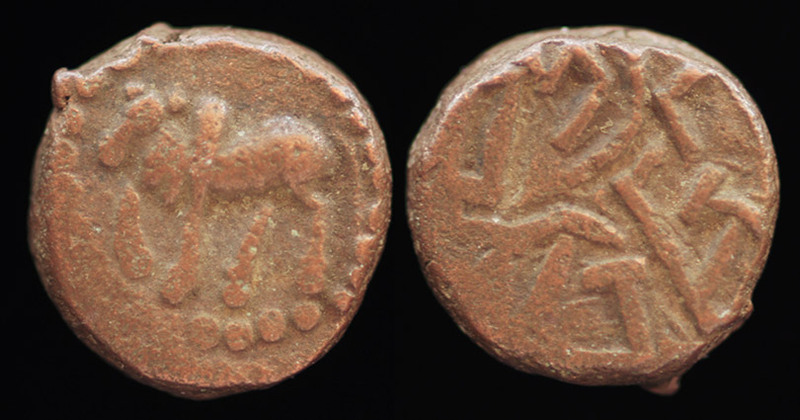 The last of the Nagas, Ganapati Naga, submitted to the Gupta Emperor Samudragupta.